Here are some images that should auto-update to help out with weather planning, i.e. inbound fronts, tropical systems, identifying and avoiding squall lines, etc. What does NWS think is coming in? Fronts and other systems moving in and for estimating time of arrival. What is going on with real time wind locally and upweather? Is it spiking in a squall line, boosting big and staying there or easing off? What is coming your way and when? Is some funky, strong wind coming over from the east coast? What does Port Manantee show on PORTS? 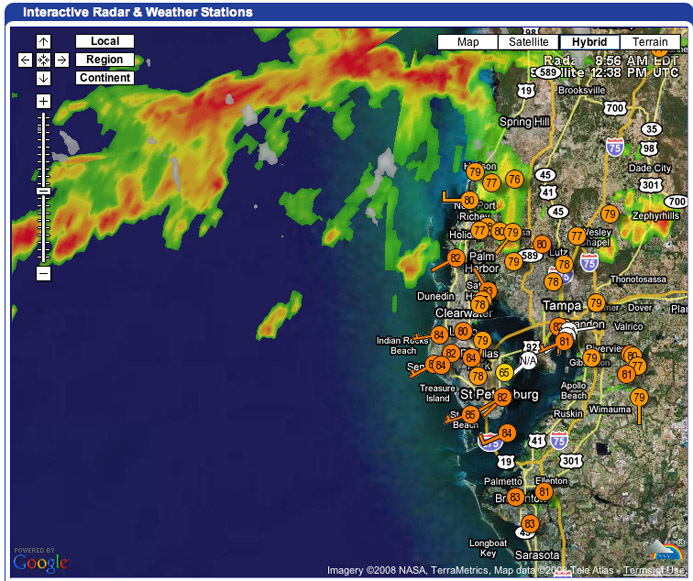 Click image to go to realtime weather site. Last edited by RickI; 04-15-2010 at 11:00 AM.